4 bedrooms, 4.5 bathrooms, sleeps 8 to 14 with couches and rollaway beds. 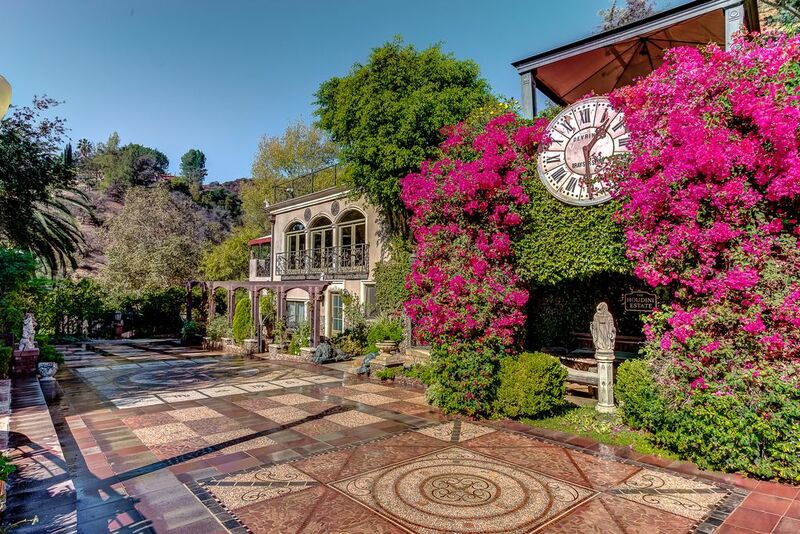 The 12 million-dollar former home of legendary magician Harry Houdini, the historic Houdini Estate, is a masterpiece of intricate craftsmanship and design. Located in the Hollywood Hills minutes from Sunset Blvd., Beverly Hills, and Universal City, the five-acre property is the most famous estate in America still in private hands. Highlights include a dramatic, three-story waterfall fed by a natural mineral spring, century-old palms and exotic trees, canyon views, one hour of hiking trails, pool, spa, BBQ patio, 7 gazebos, terraced gardens, Koi pond, and parking for 80+ cars. The house features an open-plan kitchen, 4 large bedrooms, 4 granite bathrooms, 3 fireplaces, washer/dryer, wireless Internet availability, and flat-screen TVs in all rooms. Available for film shoots, still shoots, charity events, romantic get-away, relaxing vacations, family bonding, and other regenerative life events. Sleeps 8 to 14. For 8 people, additional charges apply. Absolutely fantastic, extremely unique property. We're glad you had a good time. We were planning on a family gathering for the holidays in Oct 2016 and we scheduled a tour at the Estate. We were told the tour will cost $100 and the company will donated to a charity foundation by the company. We have no problem with it. We were also told if we make a booking during the tour we will have the $100 back plus another $100 as appreciation to our account. Woo!!! which company will do that. We took the tour and the weather was so perfect on the day we took the tour and the tour coordinator, Hazel was fantastic and easy going and very knowledgable and be able to answer all our questions like pricing, availability and thing we can and cannot do etc...... everything is so nice up there n free and fresh up there. And the tour was perfect. We ended up booking our stay at the estate. Thank you so much for your kind words. We love when our guest enjoy and appreciate the estate as much as we do. We looked at 72 venues in Southern California. Seventy two! I have the spreadsheet. I started googling "estate weddings" and ran across VRBO and Homeaway. I emailed and called all the mansion venues in SoCal and started making appointments to view the places. There was a place called the Houdini Estate. I first saw their website and thought it was nice. When I went and actually saw the place, I fell in love. It was so unique, romantic, and intimate. Jose, the owner, has built so much character into the estate. There is a huge parking space on the ground floor that would fit enough for a wedding. Then the guests would walk to the foyer of the estate where there is a beautiful fountain. There is a waterfall to the right with huge trees and flowers in the garden. The guests would walk up the stairs to see the lawn to their right where the reception would be. The lawn is big enough for more than 300 guests. The layout is perfect for anyone to decorate it however way they want. I envisioned my ceremony to be on top of the estate where the house is. There is a beautiful arch for a wedding. There are red roses blooming there right now in springtime. I have seen pictures of a wedding where they had the ceremony on the lawn and reception in front of the house but I just thought the lawn would be such great space for dinner and dancing. The patio in the back of the house is perfect for cocktail hour. Guests can also take advantage of the indoor space of the house so it is really fitting for people who want both an indoor and outdoor wedding. There is just so much to do with the estate that you can get very creative. I truly believe that the Houdini Estate is under-marketed. When I talk to vendors, not a lot of people have heard of it. My photographer told me when I first signed with her that she hadn't heard of it but a couple weeks later, she spread the word to her network and scheduled a style shoot there at the estate. It's one of those places that are not well-known right now but will become big soon. Therefore, the price to rent this estate for the entire weekend for a wedding is half the cost of a similar estate venue in featured in websites like Style Me Pretty and The Knot. This is a hidden gem that isn't commercialized and that's one of the many reasons why my fiancé and I LOVE IT!! Houdini Estate's Stood Up to Their Reviews. Lori the caretaker was very friendly and super accommdating. Lori, the well manicured grounds and the kitchen are the reasons for 5 stars. The place is very well kept, not the best venue for parking, yet Lori came to the rescue. I simply loved the grounds and would recommend it for some types of event not all types as long as the weather is nice. They have a very nice restroom near the grounds and two more inside the house. The Mansion burned down in 1959. I would strongly suggest you do a walk through before booking it for your event. It would be good to take the caterer along on the walk through. It was a peaceful Vibe and the grounds once decorated were lovely. They have a lot of interesting things to see on the grounds and take pictures of. Fact: you must take the trash with you and and purchase insurance in order to have an event there. There are lots of stairs to walk down to the main grounds. Other than that it was a beautiful event! Clean up is very high maintenance. Thank you very much. We greatly appreciate the opportunity to host your party. We will cherish this day and our time at the Houdini forever!!! My daughter wanted a fantasy wedding and we looked at numerous location around L.A. before coming to the Houdini, it was just perfect! From our first meeting with Lori, to our last e-mail with her, it has just been perfection. Not just the amazing location, but Lori and her amazing staff, and her recommendations for services, made this a perfect day for our daughter and our new son in law. One of the things we loved about this venue is that in photo's, you could be placed in Italy or Spain. It is truly a magical location! This place will be on the top of the list for many people very soon. we got the place for our wedding and were shocked we could find a place like this unique and magical. multiple layers on the property for different parts of the night. terraced garden / cabana and pool area / living quarters for late night dancing / hidden nooks for friends and couples to escape in. it's all fairly priced given there was a 3-night minimum. but the 3-night minimum is perfect if you plan to go late into the night, especially past the 2 AM LA cut-off. also, if you're doing the setup a day before, it's nice to have the whole day beforehand to get everything where it needs to be and just wake up and get ready for your day. Our friends uber'ed there and we made it the most memorable night of our life. Thank you so much for your kind words. It is always a pleasure to hear from a satisfied guest. The Houdini Estate is located in one of the most intriguing areas of Los Angeles, close to many of the area's main attractions such as Sunset Boulevard, Hollywood Blvd, The Chinese Theater, Beverly Hills, Hollywood, West Hollywood, the Kodak Center, the Hollywood Bowl, Griffith Park, and Universal Studios. Any party, event or gathering must be authorized by property manager. Long-term rentals available. National holiday weekends, Valentine's Day, Easter and Halloween include 50% surcharge. Comfortably sleeps up to eight guests, ten with couches. Please inquire for additional guests. Available for events and film or photo shoots.